The International Institute of Business Valuers (IIBV) came out with an interesting drink menu for the a panel discussion in Paris. “Not to be confused with a night cap, The Cap Rate combines creative juices with a sparkle to enhance the value of a business.” The drink is a cocktail of Ratafia of Champagne, Pineapple juice, Coco juice and Lemon juice. There’s no smoke without fire as the saying goes. 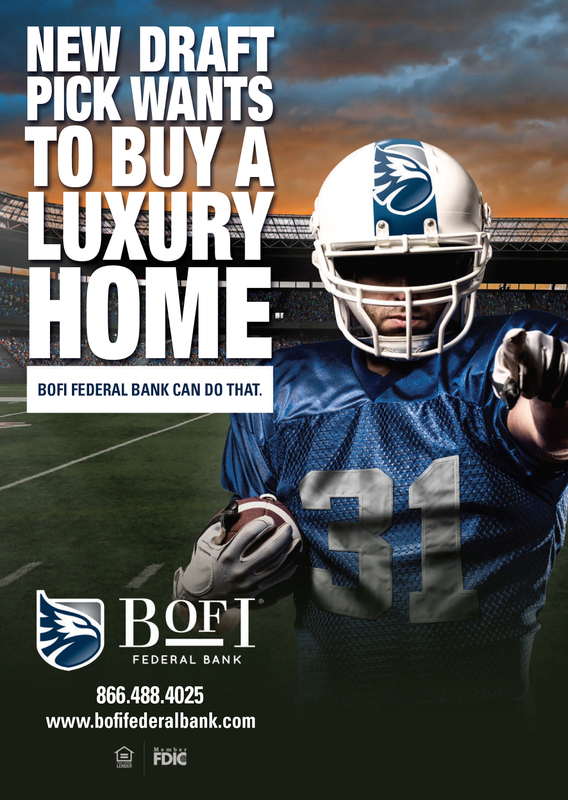 BOFI Holdings, the parent of the Bank of the Internet, is in trouble. Back in April 2015 I wrote a post (I Have a Feeling This Won’t End Well) on the company after its over the top ads caught my attention. The bank also attracted attention for its fast growth and its non-traditional lending practice. The Bank of Internet was one of the hottest banking stock until recently. We saw what happened to banks in 2008-2009 after years of growing profits with weak lending practices. Then this week, again in the NYT, a former auditor is suing the bank. The auditor said he was fired after revealing what he believed to be wrongdoing at the bank to federal regulators and management at Bank of Internet. He contended that Bank of Internet was cutting corners as it grew at a rapid pace. You probably just received your September portfolio statement and you are wondering about certain changes to your portfolio. Aside noticing the September losses in your portfolio, you also noticed that you are now the owner of two Madison Square Garden stocks, MSG and MSGN. You heard about the spin-off a couple months ago but didn’t quite know how it would go down and now the questions follow. Let’s review what happened? As an aside, if you are interested in the valuation of the MSG Company, I wrote a research piece back in June 2014, Dear Oprah: Forget The Clippers, Buy The Knicks. The investment thesis was that MSG’s intrinsic value was severely undervalued under a Sum-Of-The-Parts (SOTP) approach. The Madison Square Garden Company is more than just a famous arena in New-York, it’s a juggernaut with a portfolio of trophy assets and brands, including the New-York Knicks and New-York Rangers among them. The stock has appreciated a lot since the publication but the majority of the thesis is still valid. On October 27 2014, MSG’s board approved a plan to explore possible spin-off. It came as a surprise since the Dolan family, the family that controls MSG, isn’t reputed for listening to shareholders or Knicks fans (see petition). The move followed some interesting events. First the blockbuster sale of the LA Clippers drew a lot of attention to the Knicks’ valuation. The line of thinking was if L.A’s “second” team is worth $2 billion, an argument can be made that the Knicks are worth considerably more. Then hedge fund JAT Capital Management LP filed an activist position in August 2014 with 9% of the company. Owing such a high number stake in MSG doesn’t carry any influence since the Dolans mainly have ~69.5% of the voting power. Maybe JAT played a behind the scenes role and if they did they were pretty quiet about it. ThisBloomberg article claims that JAT has privately campaigned for better corporate governance, share buybacks, and a breakup of MSG, two people with knowledge of the matter said. Then at the October spin-off announcement MSG also appointed two new independent directors: Nelson Peltz, the veteran activist hedge fund manager from Trian Investment, and Scott M. Sperling, a co-president of the private equity firm THL Partners. On the top of that, MSG announced a $500m buyback. The news was greatly appreciated by the market with an 11% jump in the share price. The call for reshaping MSG activities was long overdue. Like I said, the Dolans were pretty dismissive about shareholder concerns. A lot of investors and analysts believed that the old MSG structure didn’t reflect the true market value. A quick peak inside MSG revealed a conglomerate made off media, real estate, venues, sports, entertainment and joint ventures. By making the company simpler, the market could attribute the appropriate market multiple to the appropriate assets. MSG decided to divide their various activities into two companies. MSG spun-off its sports and entertainment businesses from its media business. 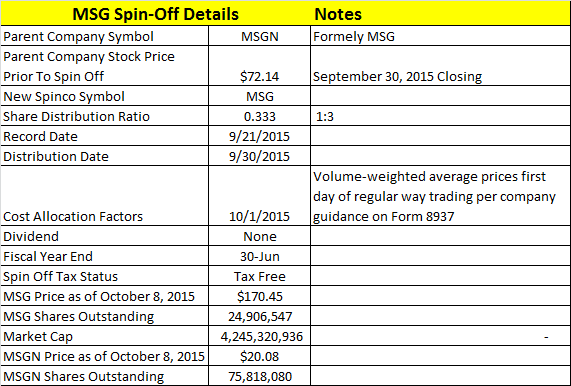 If you owned MSG on September 21 (record date), you were given shares of the MSG Spinco on September 30. For every three shares of MSG you had you received one share in MSG Spinco. So if you had 150 shares of MSG, you received 50 shares of MSG Spinco. Old MSG, is now MSG Networks and move to the MSGN ticker and MSG Spinco took over the MSG symbol. I don’t know how detailed your portfolio statement is, but here’s a calculation example on how to determine your cost basis. Basically the board and management of MSG believes that the spin-off will provide much needed operational flexibility to both the companies. By splitting the MSG into two distinct companies, it provides an opportunity to enhance its focus on primary operations and growth. MSG is home to the venues (Madison Square Garden Arena, Radio City Music Hall…etc), sports teams and entertainment line. MSGN is comprised of regional sports and entertainment networks, MSG Network and MSG+. There’s also a tax saving angle behind the spin-off. Splitting off MSG’s sports teams and cable networks in one company will make a sale of the Knicks easier for the Dolans, because it can avoid a large tax bill a year after a spin-off, and because a buyer wouldn’t have to spend billions on lower margin real estate and entertainment joint ventures. MSG and MSGN are now two independent companies with no stock ownership interest in each other but there are still some links however. MSG has entered into media rights agreement with MSGN to broadcast the games of the Knicks and Rangers for 20 years, as well as other programming. The annual right fee in the first year is $100m for the Knicks and $30m for the Rangers and is to increase annually. 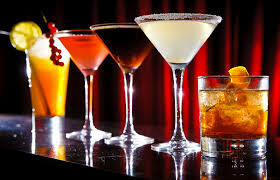 There are also other arrangements with MSG and its subsidiaries. There’s also an overlap between the executive officers of the MSG and MSGN. James Dolan will serve as Chairman of both companies and five of the board members will also serve as directors of both companies. And following the distribution both companies are still controlled by the Dolans. Below is selected financial information of the stand alone MSG Spinco to give you an idea of the financial state of the company. Historically, separate financial statements have not been prepared for MSG Spinco. The numbers demonstrate that the Media and Entertainment segment is growing pretty fast with a 17% jump in revenues last year (and the Knicks didn’t make the playoffs). The Entertainment segment represented approximately 39% of our combined revenues for fiscal 2015. MSG Entertainment presents or hosts live entertainment events, including concerts, family shows, performing arts events and special events, in our diverse collection of venues. The primary source of revenue are ticket sales. MSG Sports represents of FY2015 revenues. 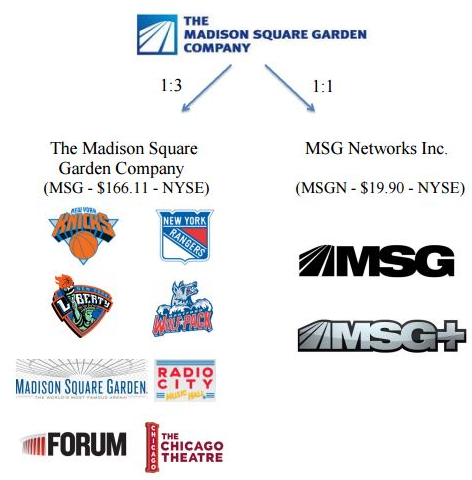 MSG Sports has several primary sources: ticket sales and a portion of suite license fees at The Garden, distributions from NHL and NBA league-wide national and international television contracts and other league-wide revenue sources, venue signage and other sponsorships, concessions and merchandising. And of course, fees from MSGN for the local rights. MSG has reported net loss for the last four years but last year adjusted operating cash flow was $118m (there’s a lot of depreciation that weights on earnings). The previous share repurchase program is terminated. MSG Spinco has authorized a new $525m share repurchase program for its Class A shares. This is due in part to the $1.45b in cash that MSGN contributed and cash flow from operations. I believe the company has the intention to buy back some shares. Under the former MSG share repurchase program, $241m worth MSG Class A shares have been purchased. The breakup could be the beginning of bigger things. Who knows what the Dolans are thinking? They recently sold Cablevisions, a company they spent 37 years building. If the Dolans are exiting the cable business, would they be open to depart of MSGN? There’s already speculation that a cable company, such as Twenty-First Century Fox Inc. (NASDAQ:FOX) or Comcast Corp. (NASDAQ:CMCSA), could make an offer for the MSG Network. The industry is in consolidation after all. Somebody could also make a move on MSG Sports & Entertainment with all its highly prized assets. It seems that the board and management have committed to enhancing shareholder value. The spin-off, the addition of two independent board members, the share repurchase program is definitely welcome. Below is a portion of my article published on Seeking Alpha on Suncor’s bid on Canadian Oil Sands. I got a few questions regarding the bid so I decided to write a post to address some of the concerns. 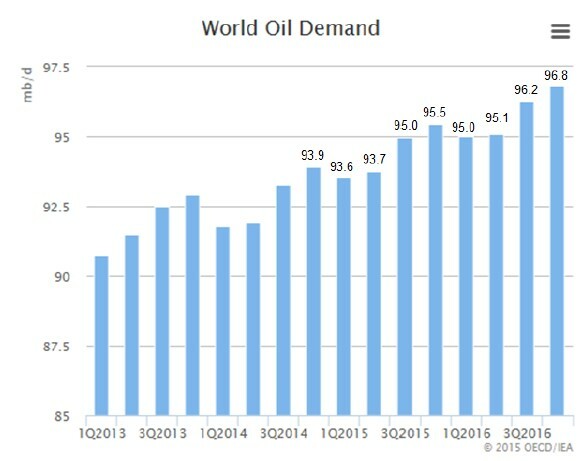 Full article at Seeking Alpha (free one). 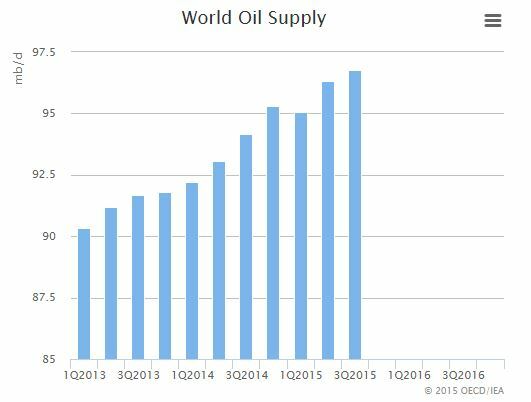 Suncor Energy looks opportunistic. The 43% “premium” sounds generous but is much lower than most investor’s average price. Suncor Energy is a much better company than Canadian Oil Sands. 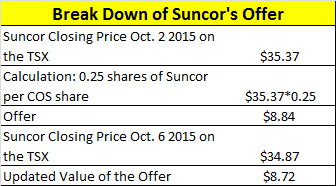 It’s Suncor’s low offer that seems to be the issue, not the share exchange. The current market price of COS expects a better offer from Suncor or a rival bid. Investors seem very split. This article is a provide guidance and a break down of the offer. Note: Dollar amounts are in Canadian $ unless mentioned otherwise. USD-CAD 1.3047 Price of 1 USD in CAD as of October 6, 2015. I woke up Monday morning with a Bloomberg notification saying that Suncor has made a hostile takeover bid on Canadian Oil Sands. The offer came in as a surprise and caught everyone off guard. Let’s just say it’s not very “Canadian” to go hostile, especially in the oil sands close circle. Then my phone started to ring and my inbox filled up with questions from investors on what they should do. People seemed more stressed than usual. I believe the source of stress is due to people feeling pressured to make a decision and since it’s related to money they want to make the right one. Another layer of stress is that most investors are likely losing money on their position on COS, which is a painful position to be in. Accept the offer and lose less money, or don’t accept and lose more money while hoping that oil prices recover one day, or sell when the stock is trading at a premium to the offer. One only needs to read the comment question of news article to see how emotional, opinionated, and split investors are regarding the bid. First you can relax because you have until December 4, 2015 5:00 pm to make a decision. A lot can happen until then. I would also suggest you read the Take-Over Bid Circular. It lays out the offer and a lot of details. It’s a very legal boring document to read but there’s section that covers the essential. Plus reading it will make you a more informed investor. People were quick to react on the little information they knew. A lot of the questions seemed to surround what they should do, whether to sell or not, or if the offer was fair, or they simply didn’t understand the offer. There are things I can answer and others that I can’t or will need to wait. The objective of this article is to help investors guide themselves. The following text is of general nature and does not constitute to be legal advice. For disclosure reasons I do not own any shares in COS. I own a little bit of Suncor and it’s not a significant position in my portfolio. Here’s what I gathered so far. (click to enlarge) Source: Google Finance. Over the last two years COS lost -53.8% of its value vs –6.55% for Suncor. Suncor has about $5 billion in cash and decided to do something about it. Suncor is making an unsolicited offer to acquire all of the outstanding shares of Canadian Oil Sands. Unsolicited means that COS wasn’t seeking a buyer. Unsolicited bids are also known as hostile bids. Suncor tried twice to buy COS and the Board rejected. Suncor’s offer was $11.84 on April 9, 2015(based on March 31, 2015 closing price, 0.32 Suncor/COS shares), much higher than Suncor’s current offer of $8.84 (based on October 2, 2015 SU’s closing price) and higher than COS’s current trading price. Suncor made another offer in April and was again rebuffed. Suncor said that the latest offer reflects the 17% drop in crude oil prices since its friendly approach. It looks like Suncor really wants this company and is now going directly to shareholders. Suncor needs 66.6% (two-thirds) of the outstanding shares of COS to be tendered by December 4 2015 to have the deal to be approved. This should be an interesting vote since COS is a widely held company. Suncor and Canadian Oil Sands have links to each other. They are both partners in the Syncrude Project. Syncrude is the largest producer of light, sweet synthetic oil from Canada’s oil sands. COS has a 36.74% interest in Syncrude but it doesn’t operate the project, its role is to manage the investment and its shareholders. Suncor has a 12% stake, meaning Suncor would own just under half of Syncrude if it successfully buys COS. Other Syncrude partners are: Imperial Oil with 25%, Sinopec 9%, Nexen 7%, Murphy Oil and Mocal Energy with 5% each. Here’s a breakdown of the offer. Suncor is offering $4.3 billion in its own stock and would take on about $2.3 billion of COS debt, bringing the total price tag to $6.6 billion. The offer is a 43% premium over the COS’s closing price on October 2, 2015 and a 35% premium over the volume weighted average trading price of the shares for the 30 trading days. This means that the value of the offer fluctuates. If Suncor’s stock price goes up, so does the offer. The opposite is also true. As a COS shareholder, you are switching your equity into Suncor. Full article at Seeking Alpha (free one). 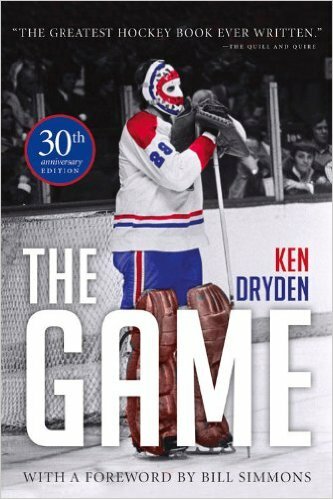 I recently finished The Game by former hockey goalie legend Ken Dryden. 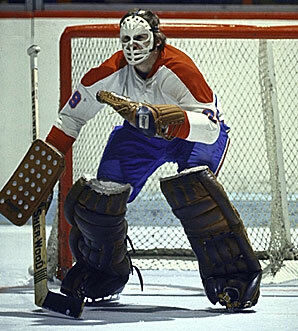 I’m too young to have seen Ken Dryden played. But I heard of him. My parents said great things about him. My grandparents had Jacques Plante, my parents had Ken Dryden, I grew up with Patrick Roy, and the new generation has Carey Price. Le Club de hockey Canadien de Montréal is the home of many hockey legends and 24 Stanley Cups. After the New York Yankees with 27 World Series Championship, the Habs are the 2nd most successful sports franchise in the world. I read the 30th anniversary edition. Sports Illustrated nominated among the Best Sports Book of All Time. It comes with a foreword by Bill Simmons (one of the top sports columnist, analyst, author, and podcaster…ESPN, HBO, Grantland. He’s also a Boston guy, which must be weird for him to write a foreword for a goalie that destroyed the Bruins). Is it the best sports book of all-time? I can’t answer that. I don’t know. I haven’t read enough sports book and there are a lot on the list. For example I still have to read Mike Tyson’s biography. I’m not saying Mike’s book is the best ever but I only think I will like that one more only because it will be more entertaining. Tyson had such a crazy messed-up life. Plus I grew up with Tyson so I can relate to him. I didn’t grew up with Dryden. That was pre-Internet era and I didn’t have hockey cards of him. You occasionally saw this old picture of him where’s he’s a giant and people would tell you that’s Dryden. Ken Dryden’s book is a great in a different sense. He doesn’t try to entertain you with crazy stories of the team back in the days. He paints a pictures for the readers of the one best dynasty of all time. It’s a special sports book. It’s a mix of a lot of things; biography, history, psychology, philosophy, entertainment, and random nuggets of wisdom. Dryden is a very smart man. What makes a player great? What makes a team come together or fall apart? Why can’t teams win one title and just keep winning? How do you stay motivated after winning enough time? This is a ~300 page book that takes on a lot. It doesn’t seem like a big book but there’s a lot of stuff in there. There’s a part of the book that talks about the team he was on. Not any team, but one of the successful sport dynasty of all time. It was nice to get a behind the scene look at such a successful team. People are attracted to success and the legends of those days are still being felt in the world of hockey (Jean Beliveau, Yvan Cournoyer, Guy Lafleur, Larry Robinson, Bob Gainy, Scotty Bowman and many others). Aside the special team, Dryden also talks about hockey on how it’s a different sports and its special place in Canadian culture, the Soviet hockey machine, rising salaries, the goalie position among other thing. It’s extremely well written. Goalies are a different breed of people. They are different. Anybody who played hockey knows what I’m talking about. They are different because of their unique position in the team and you also need a different mindset to be a goalie. I’m not saying that like it’s a bad thing because it’s not. 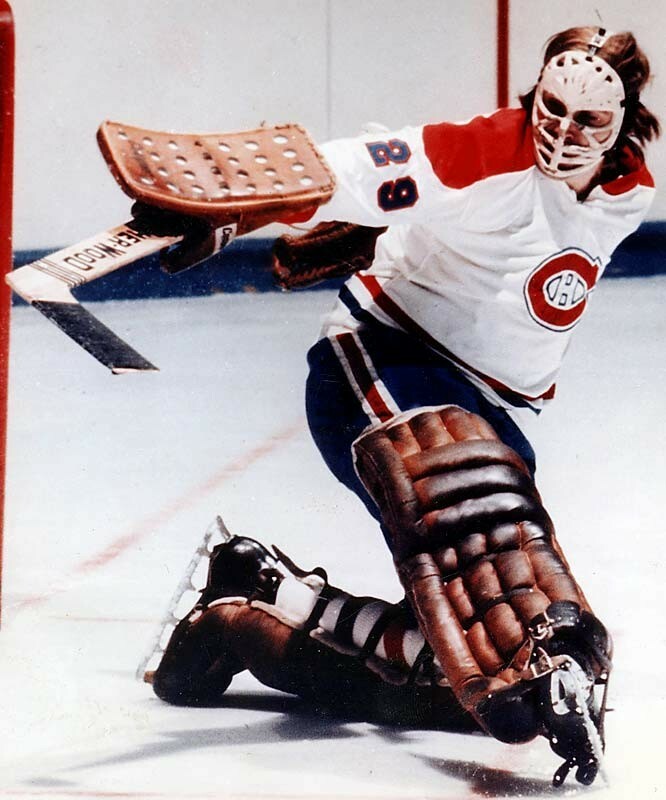 Ken Dryden was definitely different. He’s a very smart person. He’s a trained lawyer. He was a lawyer when he played for the Habs. He actually sat out for a full year to prepare for the bar exam. Then he came back and won more cups. 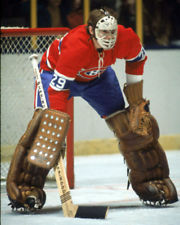 He won a total of six Stanley Cups with the Habs and he retired in 1979. It’s not a book where you need to love hockey to read it. Though it definitely help if you are a hockey fan, you will enjoy his book. Movado Group (MOV), the luxury watch maker, is the subject of my latest research published on Seeking Alpha. I make the case that Movado is currently undervalued vs its peers and that the Apple Watch threat is much milder than expected. Movado has a rock solid balance sheet with net cash, a diversified pipeline of products, is increasing sales and improving margins, and is aggressively buying back shares. The company also distributes a small dividend. 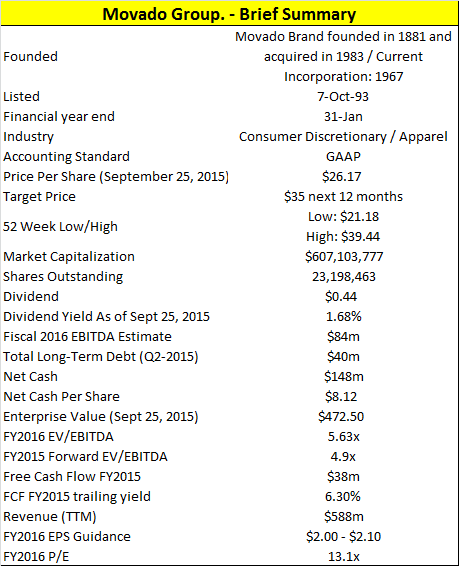 Rock-solid balance sheet with $148m in net cash. Movado trades at 4.9x next fiscal year EV/EBITDA (FY2017). MOV trades at lower multiple than its peers. The Apple Watch turns out to be a much milder threat than expected. Movado is an asset-light business. It doesn’t manufacture watches. It’s a cash-rich business. Movado is aggressively buying back its shares. 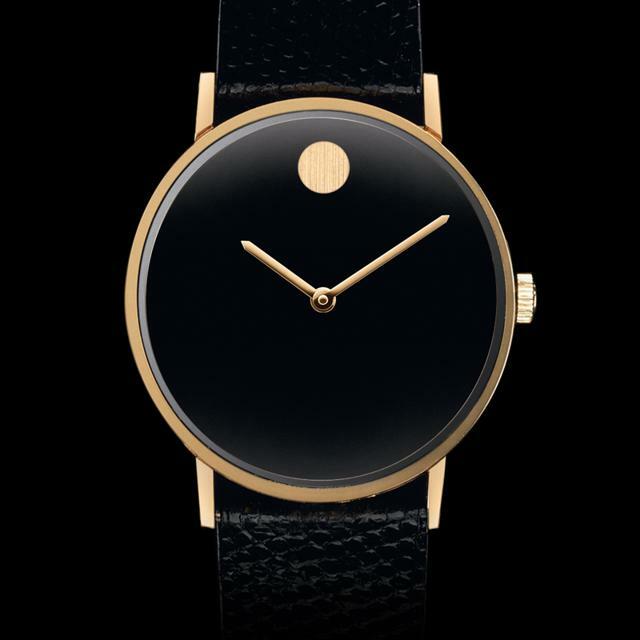 Movado Group (NYSE:MOV) is one of the world’s premier watchmakers. Movado Group designs, sources, markets and distributes fine watches in almost every major category comprising the watch industry. You have seen some of its many well-known brands. Its portfolio of brands currently comprises core brands such as Concord, Ebel, ESQ Movado and familiar fashion licensed names as Coach Watches, Scuderia Ferrari Watches, HUGO BOSS Watches, Juicy Couture Watches, Lacoste Watches, Movado, and Tommy Hilfiger Watches. The watches are fabricated through independent contractors in Switzerland and Movado is headquarted in Paramus, New Jersey. Movado is an American company, but has the majority of its watches manufactured in Switzerland and it has been a tough year for Swiss watchmakers. For the past year, Movado’s stock price has taken a major fall. Movado is under attack on two different fronts, technology and the rise of the Swiss franc. China’s recent stock market turbulence also took its toll on the stock. The introduction of the Apple Watch, combined with a surge in the Swiss franc, have sent Movado stock price from the $40s to a low of $21.42. But the single largest factor behind the decline is due to Apple (NASDAQ:AAPL) entering the Smartwatch industry. Apple is casting a giant cloud over the entire industry. Apple has a history of disrupting and dominating an industry once it enters (iTunes, mobile, tablets, you name it etc.). “Apple Watch is the most personal device we’ve ever created. We set out to make the best watch in the world,” said Tim Cook on September 9, 2015 during the Apple Watch announcement. According to the five-year performance chart above, the stock has seen better days. In November 2013, Movado hit a peak of $46.88 per share and traded in the $40s range weeks before the Apple Watch announcement. The stock has been on a downward trend most of the year to hit a low of $21.42 in August. The stock has since recovered with the release of good Q2 results on August 27, 2015. By looking at the graph, you might wonder about certain sharp fluctuations. The severe drop in November 2014 was due to disappointing Q3 results and revised downward guidance. However Q4 2014 results turned out above the revised guidance and the stock picked up to $30 to only make its way down afterward. YTD the stock is down -4.37% and the 1-year return is down -20.35%. Apple’s entry into watches is definitely a concern, but the Apple Watch turns out to be a much milder threat than expected. There’s positive side to the Apple Watch story. First it got millennials interested in watches or at least talking about them. One needs to look at a company like Shinola, which prides itself on manufacturing its watches in Detroit; it’s a major hit among hipstersand I should mention that the company’s watches are good old quartz ones, not smart. Swatch Group AG (OTCPK:SWGAY) said the company has been trying to sell its smartwatch since 2000. Now that Apple is there, demand for Swatch’s smartwatches has boosted. Second, concerns about smartwatches are driving innovation across the Swiss industry, which could help longer-term sales. Most brands are coming out with some kind of wearable/smart device. Some will be hits, some will be mostly misses. However, this innovation will plant the seeds for the future of the industry. There will be trickle-down effects and lead to better products down the line. Movado doesn’t have significant exposure to Asia, with only 8% of net sales. The U.S., a strong and growing watch market, is responsible for 55% of Movado’s sales. Swatch Group AG, probably Movado’s most comparable competitor, has a lot of exposure in Asia. Swatch posted a 20% drop in first-half profit, and noted weaker demand from markets, such as Hong Kong, but net sales increased 2.2% to 4.19 billion swiss francs from 4.1 billion swiss francs. Updates from the Compagnie Financiere Richemont (OTCPK:CFRHF) and Prada (OTCPK:PRDSY) were better than expected, despite the turmoil gripping China. Basically this is saying that China’s thirst for luxury goods is still there. There are many things that I like about Movado. It is a business that has good or improving economics, and often generates sales and profits in multiple jurisdictions. Movado is cheap. It is attractively valued at 4.9x next fiscal year EV/EBITDA and a price to earnings of 11.3x (detailed valuation below). The balance sheet is mostly cash and inventory. The company carries net cash of ~$148m. That’s a lot of cash when your market cap is about $600m. At the moment, Movado is completing a $100m share buyback program. It’s expected to continue to aggressively buyback shares with a renewed program in November 2015. Usually when you buy 10%-15% of the float, it should fuel EPS higher. Movado trades at 1.3x book value and no value is given to its own brands. Movado’s brands – Ebel, Concord, ESQ, and Movado – are given no intangible value on the balance sheet. They are obviously worth something on the open market, since they bring so much cash to Movado. The business model is asset-light, because the capital intensive process of manufacturing watches is done by somebody else. The latest quarter revealed that the Apple Watch threat was overblown. Sales were up 1.4% over the same quarter last year, and that’s taking into account a $6.8m hit because of the currency fluctuation. Movado also maintained its full-year guidance for this fiscal year. As for the smartwatch threat, Movado is entering the arena in Q4 with its own “smart” device. And last, I’m not a watch connoisseur but I really like the look of the classicMovado Museum style. I find a lot of watches to be jam-packed with info and too crowded (Movado has those too). I just need a watch that looks good with a suit or to go out to a dinner, not a tool to control a space station. It’s clean, simple, and elegant. There’s an intangible there. Movado watches looked great forty years ago, look great today, and will look great in forty years. You can read the complete research and the valuation on Seeking Alpha (they have the rights to the article.